I sell my buckets at cost to a number of farmers in the area, who mainly use them as harvest pails or feed storage. One farmer sends them back to me full of food as part of my CSA subscription. CSA means “community supported agriculture,” whereby food eaters pay food producers for an entire growing season’s worth of food up front, allowing the farmer to pay for seed and equipment (not to mention rent!) without having to go to a bank for a loan. It also helps offload some of the financial risk from the farmer onto the food eater. This means your farmer will still be farming next year, even if their crop is damaged by pests or drought. Many CSAs are delivered in rubbermaid totes, which can cost three or four times as much, and do not have a convenient carrying handle! 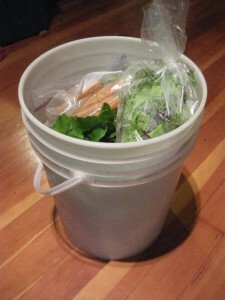 Sometimes my CSA box comes with a couple inches of water in the bottom, which keeps the leafy greens fresh and alive!